Since I've started my new job at a marketing agency, my complexion has never really been quite the same. Burning the late hours, irregular meal times and high stress levels over deadlines are things that come with the territory, but it has never the less left me disheartened. Thankfully, the lovely fairies at Estee Lauder must have heard my silent cry for help when they sent over this Estee Lauder Nutritious Vitality8 Radiant range. So what does the "8" in the range signify? Infused with Estée Lauder’s proprietary, highly potent new Pomegranate8 Complex, this new collection promises to recharge skin in just 8 days, with a medley of 8 potent ingredients to reset skin’s natural equilibrium and activate 8 dimensions of radiantly healthy looking skin. I start my day off by patting a small, comfortable amount of the Nutritious Vitality8™ Radiant Dual Phase Emulsion ($92). You'll need to shake it well before you applying, though. I like the lightweight, watery texture that's really refreshing to the skin and fast absorbing. I feel it delightfully tingling into my skin especially so, after I've scrubbed and toned my face. It contains ginseng which works together with the Pomegranate8 Complex to revitalize skin into natural radiance. What's special is its dual-phase formula which not only fortifies skin’s inner moisture barrier such that skin retains a natural dewy effect, which I could almost see instantly. Because I am such a junkie for hydration, I top it over with the Nutritious Vitality8 ™ Radiant Moisture Creme ($92), which gives the external layer of my skin extra boost. Coupled together, this creme additionally helps to protect skin against environmental aggressors with anti-oxidant power of pomegranate. I found it non-greasy and great as a pre-makeup prep. For me, I found this the star of the range; the Nutritious Vitality8™ Radiant Overnight Detox Concentrate ($116). Encased in a lovely pump bottle, the concentrate is in gel-creamy consistency that glides easily on skin. It actually contains highly concentrated pomegranate power, this is an intensive detoxifying, as well as clay to help absorb impurities and detoxify the skin, thus diminishing appearance of pores. To use, slather on generously at night before moisturizing so that skin can better absorb the nutrients. However, its stated as a seasonal use so you are recommended to use it for 28 days straight at the start of any seasons for better results. I found the Nutritious Vitality8™ Radiant Overnight Creme/Mask ($106) rather rich on my skin, so I tend to go no more than a 10c dollop. It's heavier, creamy texture really does hydrate drier patches of my face well, evidenced by when I wake up to a more supple, dewy-looking face the next day. Because of its thickness, you can also use this as sleeping mask for a more intense moisturization, which I reckon would be a great travel essential for cold countries. Personally, I love the fruity burst of goodness when using the Estee Lauder Nutritious Vitality range, but I do think that it is abit to rich for my break-out prone skin. I'd opt mostly the concentrate for periodical detoxification as well as the emulsion for a potent skincare pick-me-up when needed. I've been using the range for a month and am glad to report that things are looking better: my skin looks more clarified and radiant, and I even observed redness around my nasolabial fold disappearing...a far cry from the tired-looking office entity I was formerly! And with the latest worsening haze situation we are facing here, there is no better time to stock up on anti-oxidant skincare than now! Pomegranate has long been known for its incredible anti-oxidant properties against aggressive free-radicals in the environment, so better to invest in good protection for the long run. Thank you Adeline and Estee Lauder for the beauty lifeline! 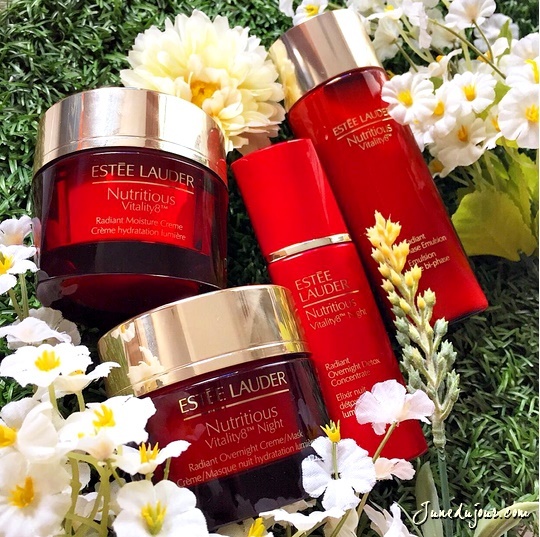 The Estee Lauder Nutritious Vitality range is currently retailing at all Estee Lauder counters and Sephora outlets island wide.